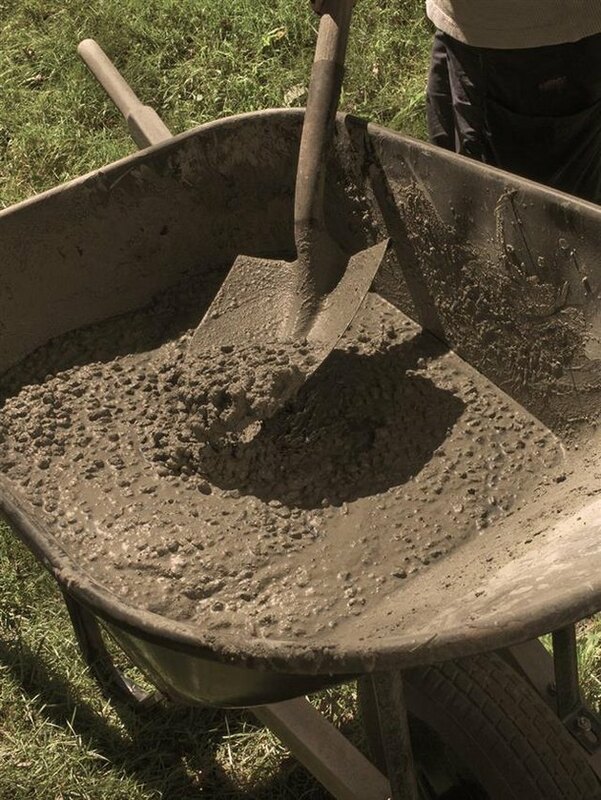 When you hand mix concrete in a wheelbarrow, it's ready to be transported and dumped. Whether it's for a slab to support a shed, for a walkway, or simply to anchor some fence posts, sooner or later you're likely to need to mix yourself some concrete. Luckily, it's easy to accomplish as long as you are careful to add no more water than necessary and you make sure to mix it well. Concrete is a combination of dry Portland cement, sand, and gravel, to which water is added. The water produces a chemical reaction in the Portland cement called hydration, which results in the formation of a crystalline matrix that binds all the ingredients together. Too much water in the mix results in a diffuse matrix, which yields weaker concrete. When the amount of water in the mix is kept to a minimum, the concrete will be optimally strong. Add water judiciously and mix thoroughly. The easiest way to supply the concrete mix you need for your project is to buy dry premixed concrete in 60- to 80-pound bags from your local home improvement center, lumberyard, or hardware store. You may encounter more than one kind of concrete mix to choose from, as there are specialty mixes intended for specific circumstances (we'll talk about those later), but for most purposes, the standard mix (sometimes called gravel mix) is the right one to choose. An 80-pound bag of concrete mix will give you about 0.6 cubic feet of hydrated concrete. To estimate how many bags you will need for a slab or a walkway, multiply the length x width x thickness in inches, then divide the sum by 1728. This calculation gives the volume in cubic feet. Divide the result by 0.6 and round up to the nearest whole number—the resulting number is the number of 80-pound bags you need. If you are using the concrete to anchor posts you'll just have to make a reasonable guess and be careful to keep the bags of concrete mix protected in case you wish to return some. 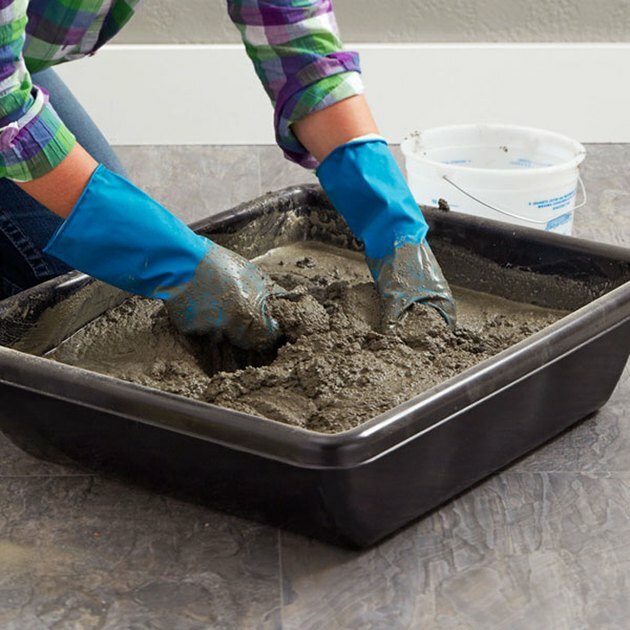 You can use a mortar tub or homemade box to mix your concrete. 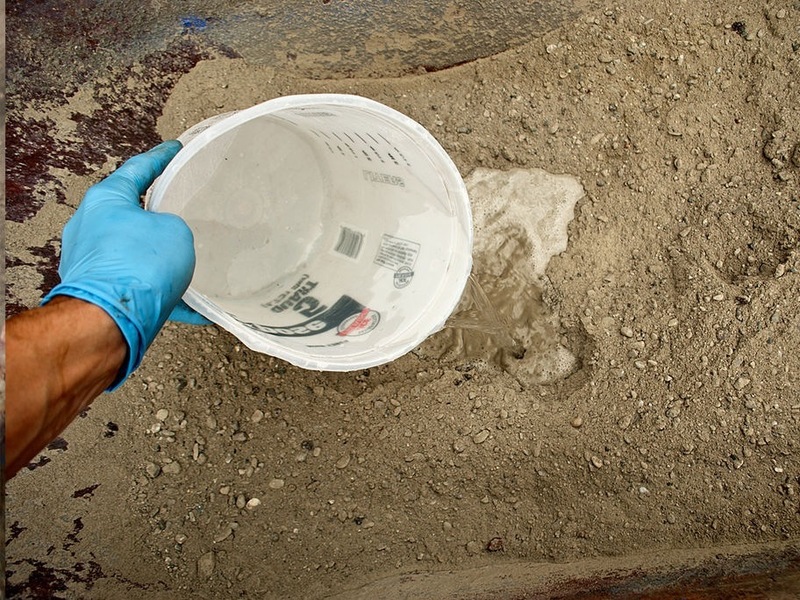 Use a wheelbarrow or an inexpensive mortar tub to mix your concrete in, one bag at a time. You can use a bucket if you are mixing less than a full bag, but take particular care to thoroughly hydrate the dry ingredients in the bottom corners of the bucket. If you are using a wheelbarrow or a tub, a shovel or a hoe makes a suitable mixing tool. Consult the manufacturer's recommendations as to the proper amount of water to add to the mix, and have that amount premeasured and standing by. Never use a hose to add water to concrete—especially if you are not familiar with the consistency and appearance of the correct mixture. Place a bag of concrete mix in the wheelbarrow or tub and cut it open with a knife or with the blade of a hoe. Lift the bag to dump out the contents and remove the paper. With your shovel or hoe, make a depression in the center of the pile of dry mix. Pour about two-thirds of the premeasured water into the depression. Combine the water and dry mix as completely as possible, with the objective of getting the mix uniformly moistened. Intermittently add small amounts of the remaining water and mix it in, stopping when the mix is about the consistency of peanut butter and a fistful squeezed in your gloved hand will hold its shape. If it's too runny, add some dry mix or sand to bring it back to the ideal consistency. Clean your tools as soon as possible. It's a good idea to keep an extra bucket of water nearby in which you can place your shovel or hoe after mixing, and be sure to wash out your wheelbarrow or mixing tub when you're finished. Once the concrete residue has been allowed to dry, it can be nearly impossible to remove. 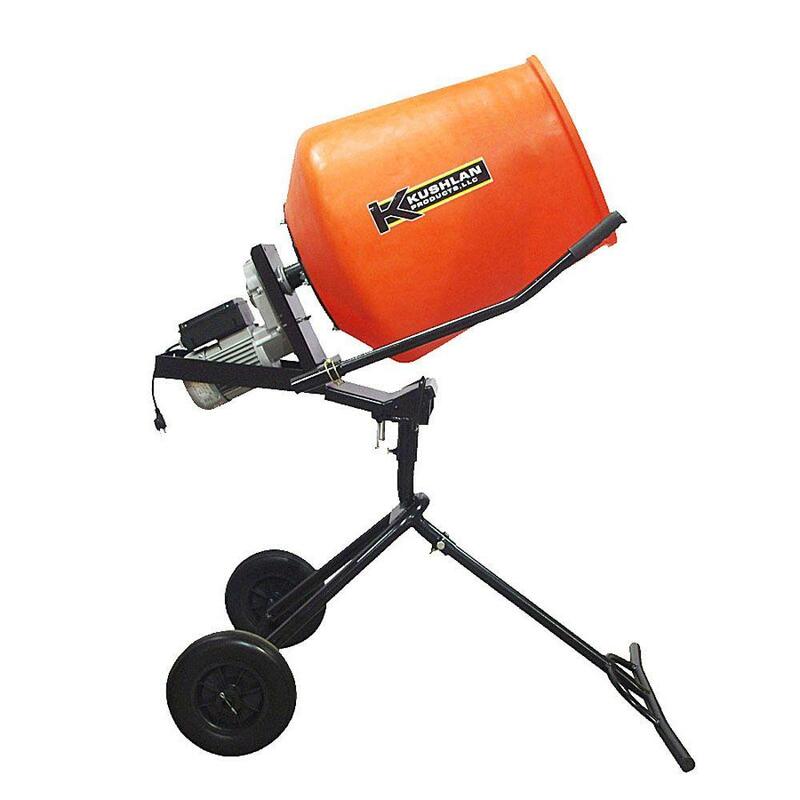 If the size of your project will require dozens of bags of concrete—and it's surprising how fast they add up—consider renting an electric concrete mixer. An electric mixer will produce batches of properly mixed concrete more quickly than hand mixing can. You may, of course, use bagged concrete mix in an electric mixer, using the same proportions of water and mix that you would use for hand mixing, but you could also choose to combine Portland cement, sand, gravel and water to produce your own concrete. The recipe for standard concrete is one part Portland cement, two parts sand, and three parts gravel. To assure that you maintain a consistent and correct proportion, dry mix the ingredients before adding them to the mixer. An electric mixer can make the job go quicker and easier. It's a good idea to wet the inside of the mixer drum before you start mixing. It will make clean-up a little easier. Shovel some of the dry mix into the drum. Keep track of how many shovelfuls you put in. You want to establish the proportion of dry mix to water necessary to make the correct concrete consistency. Add water a little at a time. As with the dry mix, it's important to determine the correct ratio, so keep track of how much you've added. After each addition of a little more water, allow the mixer to completely blend the mixture. Test the hydration frequently. You want that same peanut butter-like consistency that was the aim of hand mixing. If you are working with bagged dry mix concrete, pour in a bag and add two-thirds of the recommended water. When that is thoroughly mixed, add the remaining water until you reach the correct consistency. You may be able to mix more than one bag at a time, but don't overload the mixer. Immediately after your last batch of concrete, clean your tools and equipment before the concrete residue has a chance to harden. For the great majority of home projects, standard concrete mix is most suitable, but occasionally, circumstances may point to a specialty concrete mix as a better choice. 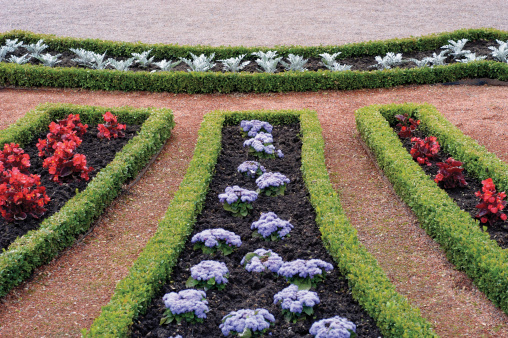 Different manufacturers call their special purpose concrete mixes by various names but the purposes remain similar between brands. Quick-setting concrete is formulated to harden faster than standard concrete. It is useful in situations such a walkway where it is desirable to have it usable as quickly as possible. Crack-resistant concrete contains synthetic fibers in addition to the cement, sand and gravel. The fibers make the concrete less prone to chipping and cracking; this formulation is often used on steps and other applications with exposed corners and edges. Green concrete mix contains a percentage of recycled material—fly ash and recycled aggregate—in place of some of the sand and gravel. Post-setting Concrete is another fast-setting blend. The advantage of many post-setting mixes is that they can be poured dry into the post hole and "activated" with water—no mixing necessary. How Much Water Is for 60-pound Concrete Mix?